Alex Garland's sci-fi masterwork was one of 2018's most WTF movies, following a group of scientists who head into a mysterious quarantined zone known as The Shimmer, within which lies an ambiguous extraterrestrial force brought to Earth by a meteor. Leading the pack is Lena (Natalie Portman), who undertakes the mission to figure out what happened to her husband, Kane (Oscar Isaac), after he previously spent a year missing in the Shimmer. Lena and her team eventually learn that the Shimmer is capable of refracting the DNA of anything within it, creating horrifying hybrids, where humans have giant worms for intestines and bears can growl the dying screams of their victims, for instance. In the third act, Lena reaches the origin of the Shimmer within a lighthouse. Here she learns that Kane in fact committed suicide and the man who returned was a doppelgänger created by the Shimmer. She then comes across her only surviving teammate, Ventress (Jennifer Jason Leigh), who quickly succumbs to the Shimmer and transforms into a nebulous object, before absorbing a drop of Lena's blood and creating a metallic doppelgänger. 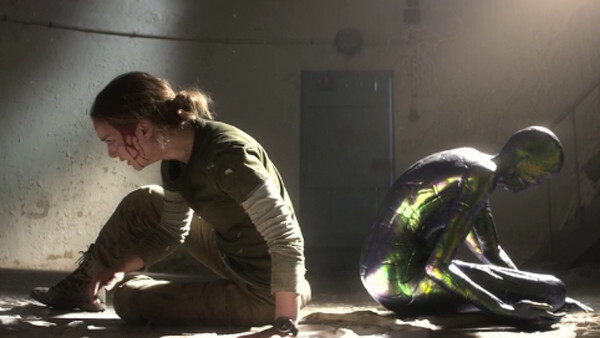 The clone mimics Lena's movements exactly, but by handing a white phosphorus grenade to the doppelgänger, she's able to kill it and burn down the lighthouse. The fire appears to destroy the Shimmer, and the film ends with Lena meeting Kane's doppelgänger. They embrace and their irises both glisten, prompting the viewer to question whether or not the real Lena escaped or her impostor. Annihilation is a complex, thematically rich film which visualises depression and self-destruction in an extremely unique way. But the very end of the film is ultimately a sci-fi spin on the famous Ship of Theseus thought experiment: are Kane and Lena really who they appear to be, and are they still human, despite their DNA being altered so significantly?